Top 5 global smartphone brand Vivo introduces exciting activities and offers for consumers as it joins SM Supermalls to celebrate its 30th anniversary through SM Cybermonth. Vivo will be joining SM Supermalls in several mall road shows across Metro Manila throughout the month with activities for mallgoers in Metro Manila, Laguna, Paranaque, Bulacan, and Cavite. 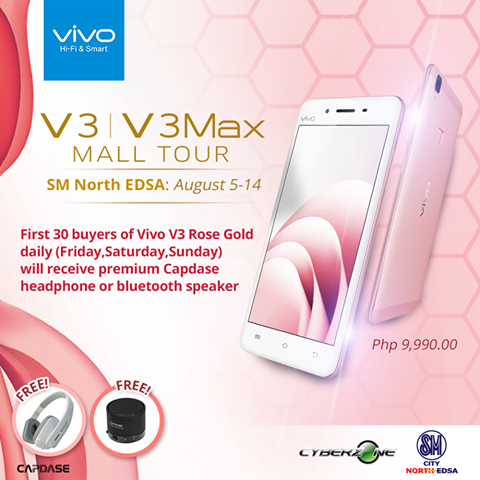 During the mall road shows, Vivo will also be showing their support for the retail giant’s 30th year anniversary through a promo where the first 30 customers who purchase the rose gold Vivo V3 smartphone every Friday, Saturday, and Sundays of the road shows will receive premium Capdase Bluetooth headsets or Bluetooth speakers. “We acknowledge the leaps and bounds that SM Supermalls has done to provide Filipinos accessibility to their favourite brands. We at Vivo are honored to join SM Supermalls for a month-long celebration to give back to their customers,” said Vivo Philippines Vice President Hazel Bascon. Consumers can purchase the rose gold Vivo V3 in major retailers and Vivo booths during SM Cybermonth for PHP 9,990. Vivo V3 is 5-inch phone, powered by an Octa(8)-core processor and a 3 GB RAM. It has a 13MP main camera(8MP front) and already loaded with fingerprint sensor and Android Lollipop mobile operating system. With a price point of just 10K we find it reasonable enough to get a Vivo V3. Don't forget to get it in Rose Gold and get the freebies!